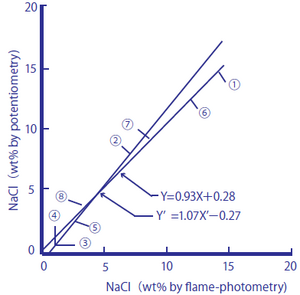 In the figure, the horizontal axis represents measurements using the flame photometer, and the vertical axis represents measurements with the potassium electrode. They show a high level of agreement (correlation coefficient r = 0.99, n = 15). 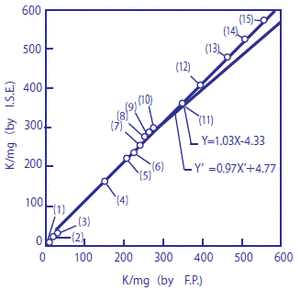 These values indicate the amount of potassium in mg contained in 100 g of sample. The amount of potassium contained in the following 15 types of foodstuffs and beverages were measured: (1) grape juice, (2) alkali ion drink, (3) sports drink, (4) milk, (5) tomato juice, (6) cucumber, (7) ham, (8) potato, (9) cabbage, (10) Worcester sauce, (11) banana, (12) soy sauce, (13) tomato ketchup, (14) parsley, and (15) soybean paste. Direct measurements were performed on specimens (1), (2), (3), and (4) following pH-adjustment, without them being diluted. Before carrying out measurement, around 1 g of each of specimens (5) to (15) was diluted 100 times. Amongst these, specimens (5), (7), (10), (12), (13), and (15) were pH-adjusted, and hydrochloric acid was added to diluted specimens (6), (8), (9), (11), and (14), making 1%-hydrochloric acid solutions which were then neutralized with sodium hydroxide. The solid food samples were thoroughly mashed using an agate mortar prior to performance of the treatments described above. 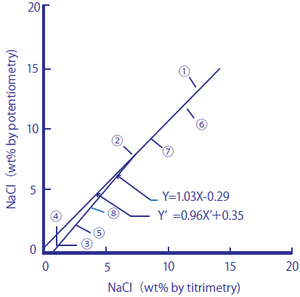 The following two figures compare the salt content (salt equivalents) in processed foods measured by using a sodium ion selective glass electrode against those measured by the titration method (Mohr method) and sodium flame photometry. The processed foods used were ① soy sauce, ② Worcester sauce, ③ tomato juice, ④ vegetable juice, ⑤ the liquid from canned tuna flakes, ⑥ miso, ⑦ cod roe, and ⑧ tomato ketchup. As samples, 1.00 cm3 of ① and ②, 10.0 cm3 of ③, ④, and ⑤, and 1.00 g of ⑥, ⑦, and ⑧ were taken, and pure water was added to them until the total amounts of the sample solutions reached 100 cm3. The measurement values are shown in percent by weight (wt.%). These processed foods contain monosodium glutamate and other substances that produce sodium ions in addition to salt. The measurement results obtained by the titration method, which measures chloride ions, agreed well with those obtained by the sodium ion selective glass electrode method, and it is assumed that many of the sodium ions contained in the processed foods come from salt in the measurement range. The measurement results obtained by sodium flame photometry method agreed well with those obtained by the sodium ion selective glass electrode method, and it is assumed that the processed foods have low potassium ion content, which affects measurements with a sodium ion selective glass electrode. As an industrial application of ion electrodes, we will explain about the monitoring of minute amounts of sodium ions. Steam drives the power generation turbines at both thermal and nuclear power plants. The steam is then cooled by external water (mainly seawater) via heat exchangers and eventually condensing to become boiler water once again. If pin holes occurred in the heat exchanger, these would result in a minute amount of seawater getting into the boiler water. A minute-quantity sodium ion monitor with an Na+ electrode as the detector is used to watch for this. Reference solutions of 10-6M (23 ppb Na+) and 10-7M (2.3 ppb Na+), together with actual boiler water were measured using a minute-quantity sodium ion monitor. The above diagram* shows the results. Prior to carrying out measurement, an amine solution was added to the reference and sample solutions in order to make them strongly alkaline as a protection against obstruction by hydrogen ions. 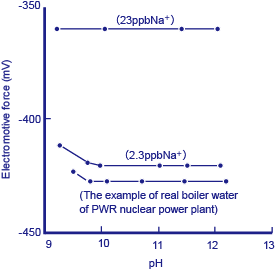 Although around 0.6 ppb of Na+ was detected in the actual boiler water, since it is difficult to prepare reference solutions correctly at this level of concentration, this value cannot be claimed to be accurate. However, even a small amount of seawater getting into the boiler water causes a sudden change in this value, and immediately sets off a warning alarm indicating that pin holes may have developed in the heat exchanger (cooler). The colorimetric method measures fluorine atoms in the bound state (e.g. F in CaF2) by distillation of a test solution, while the ion selective electrode method detects free F- only. Although the measurements from the two methods differ (the colorimetric method showing higher concentrations), the trend that they follow agrees well. In the effluent treatment of solutions that contain fluorides, precipitated CaF2 is removed, so it is important to detect the concentration of free F- ions.